JOIN THE DEPTFORD ANCHOR CLUB ! White Deptford Is Forever logo printed on 100% cotton black long-sleeved t-shirt. White Deptford Is Forever logo printed on 100% cotton navy long-sleeved t-shirt. Navy Deptford Is Forever logo printed on 100% cotton white short-sleeved t-shirt with scoop neck, fitted waist and capped sleeves. Printed on 100% natural canvas cotton. 38cm wide x 43cm deep, with long handles so that you can hang them on your shoulder – perfect for high street shopping! In NAVY, CREAM and BLACK. Please specify colour when ordering. 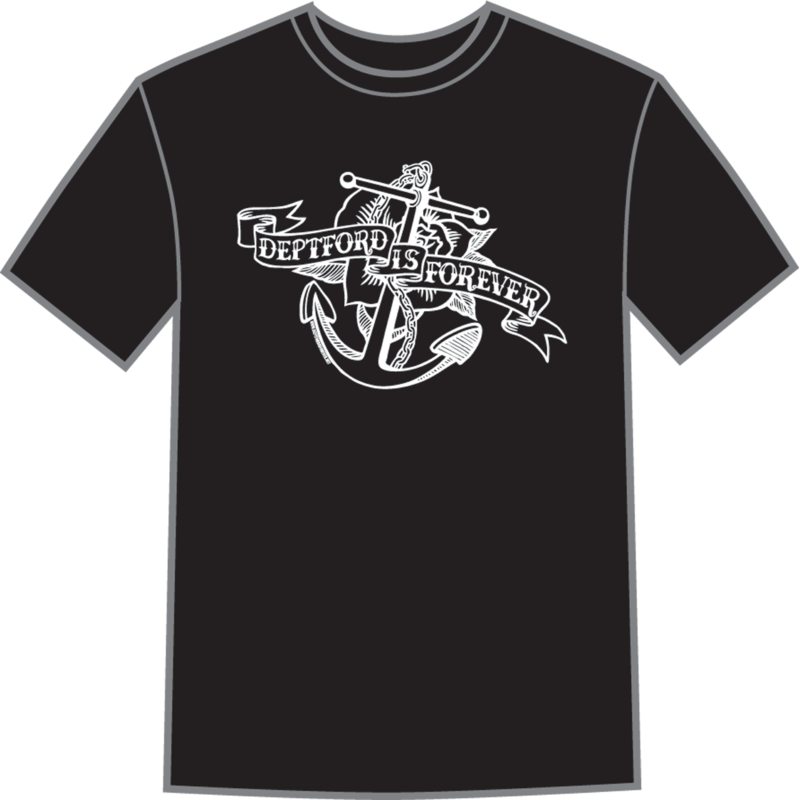 White Deptford Is Forever logo printed on 100% cotton black short-sleeved t-shirt. 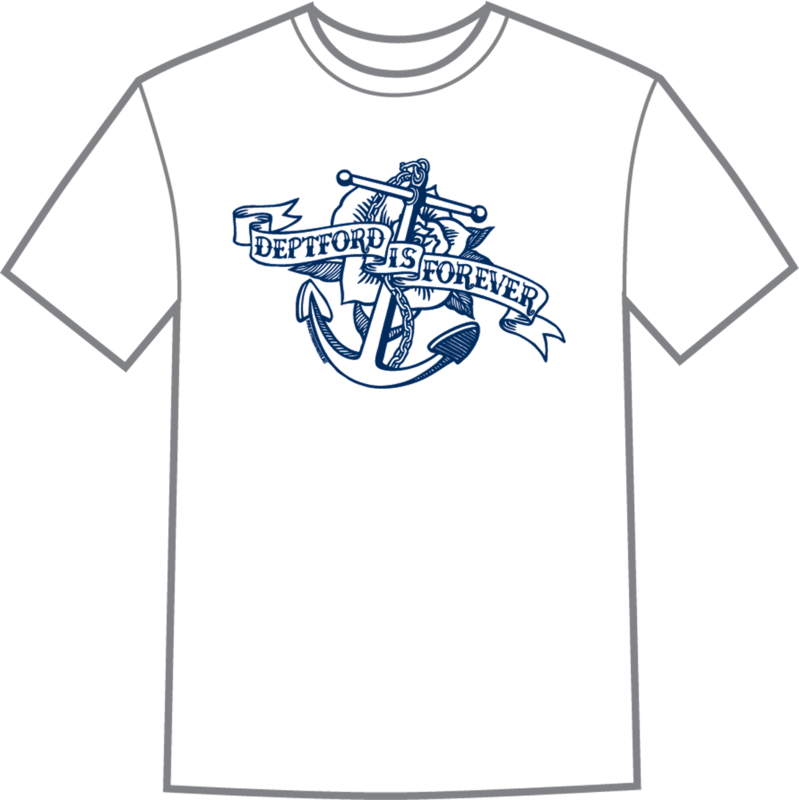 Navy Deptford Is Forever logo printed on 100% cotton white short-sleeved t-shirt. Opening hours: Wed–Sun, midday to 10.30pm. Opening hours are 8–5 Mon-Fri, 9-5 Sat, 9-4 Sun. You can also reserve a shirt or bag to be picked up at the above places by using the online form below. If you're not local and want to order online, please get in touch! We will then send you an invoice via PayPal (you do not require a PayPal account) and once paid, we'll send you your lovely order.